Oil and gas companies rely on Big Top’s fabric structures for sandblasting and paint applications. Our shelters provide proper containment for all types of blasting, including Black Beauty abrasives, as required by the Environmental Protection Agency. Plus, they can be erected to meet your needs quickly. 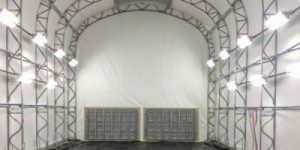 In fact, no other sandblasting and paint containment building can be built and ready for use faster than our fabric structures. To ensure your sandblasting and paint applications can be performed safely, we can equip your shelter with an HVAC and ventilation system to remove fumes and other harmful airborne particles from the air. The fabric roof blocks 99.95 percent of harmful UV-A and UV-B radiation to keep your staff safe and comfortable. Additionally, the roof is NFPA701 flame-retardant. There are many accessories Big Top can include with your fabric shelter to meet the needs of your sandblasting and paint operations. For instance, we can install large access doors for convenient movement of large equipment and materials. The translucent fabric roof will allow plenty of sunlight to enter the facility during the day, saving on energy costs, but we can also install a system for artificial lighting if your production runs into the night. Big Top’s tensile shelters cost far less than traditional brick-and-mortar buildings, and they can be relocated if your operations move, saving you the costs of having to construct multiple structures. And, with the proper training, they can be assembled without the need for hiring a construction crew. Because our structures can be deemed equipment with the IRS, there may even be tax advantages from which you can benefit. To speak with a representative about how we can customize a fabric structure to meet the sandblasting and paint requirements of your oil and gas company, contact Big Top today.